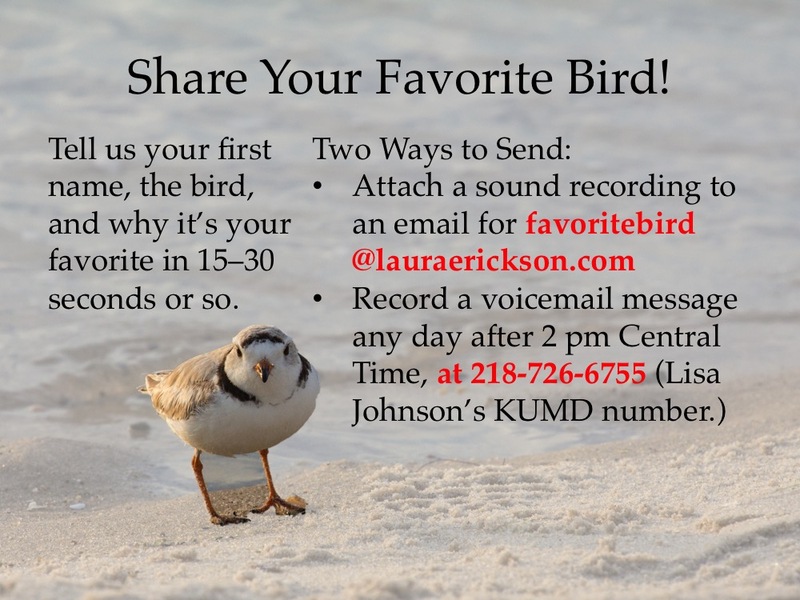 On September 18, I got a phone call from a WXPR listener named Joan who was in the midst of a bird emergency. A tiny bird—she suspected a warbler—was sitting lethargically near her house, and she didn’t know what to do. I asked her to email me a photo so I could verify its identity, and sure enough, it was an Ovenbird—nationwide, one of the top three victims of collisions with human structures, especially windows. 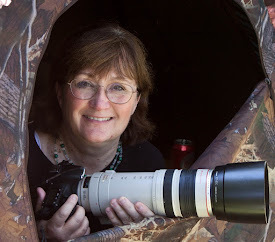 Ovenbirds don’t visit feeders—the one just happened to be passing through Joan’s neighborhood, and her window just happened to be in the wrong place at the wrong time. 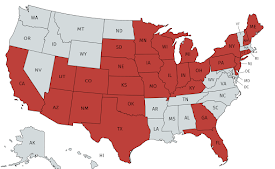 Dr. Daniel Klem, who since the 70s has spent his career researching the issue of birds colliding with windows, found that about half of the birds that hit windows are killed. 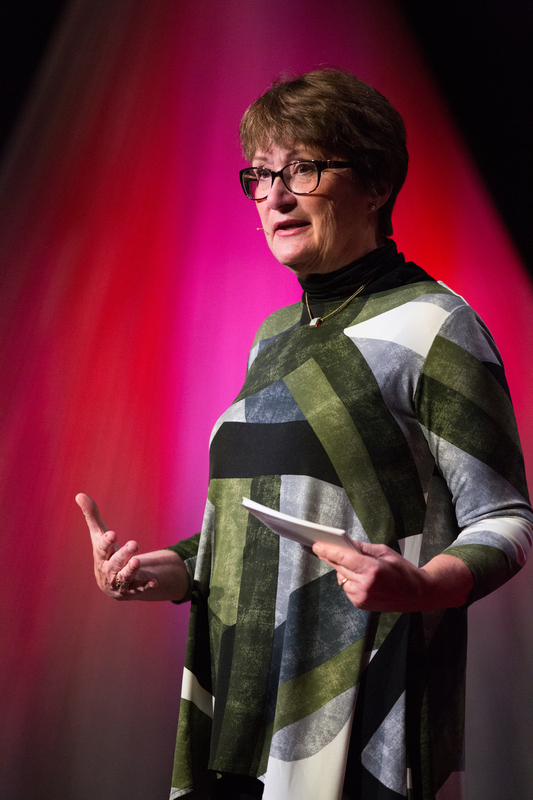 Some die immediately, some by predation while in a dazed condition, and a great many from internal trauma, especially head and spinal injuries that may not manifest for hours or even days after. So of the ones that fly off, seemingly as good as new, some do end up dying, but some recover, and the least we can do is try to improve their chances. That means taking dazed birds out of harm’s way. A few years ago during fall migration, a Yellow-rumped Warbler collided with a downstairs window right next to where I was working. Started, I jumped up and saw it on the ground, blinking, even as a Blue Jay swooped in and grabbed him. To respond so instantaneously, the jay must already have learned to associate the smack of a bird on glass with an easy meal. But even when a savvy corvid doesn’t happen to be right there, the longer a collision victim sits helpless, the more likely some opportunistic predator or scavenger will come by and dispatch it. So the quicker we can get collision victims out of harm’s way, the better their chances of being among the 50 percent who survive. 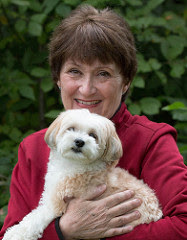 Joan’s bird didn’t show any obvious injuries—it was simply dazed, due to a probable concussion. So I told her to line the bottom of a shoebox with paper towels, make a few air holes, and put the Ovenbird inside. Paper towels are not slippery like bare cardboard or newspapers would be. The impulse of many people is to put injured birds near a stove or other heat source, but it’s easy for adult birds to get heat stressed, so it’s best to put the box in a quiet place where the temperature is comfortably cool, not hot. Darkness and quiet will help it rest. If a bird is too dazed to even try to elude you, it’s too dazed to eat or drink, so don’t worry about providing food and water yet. Good news! When I opened the shoebox outside under some low hanging pine boughs our little patient looked "bright eyed and bushy tailed" as they say. He started scratching around in the leaves. I left him there for a little while since it was a very protected area, and when I came back he was gone. He looked much more alert and strong so I am hopeful that his overnight rest allowed him to recover sufficiently to survive. 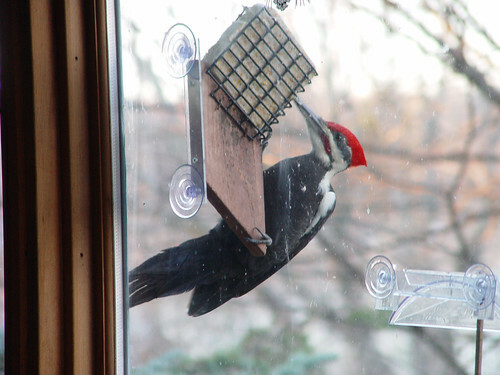 To minimize crashes of birds visiting our feeders, it’s always wisest to place the feeders right on or within 3 feet the windows—if birds still don’t notice the glass and take off and collide with the window, they won’t have enough speed to injure themselves. 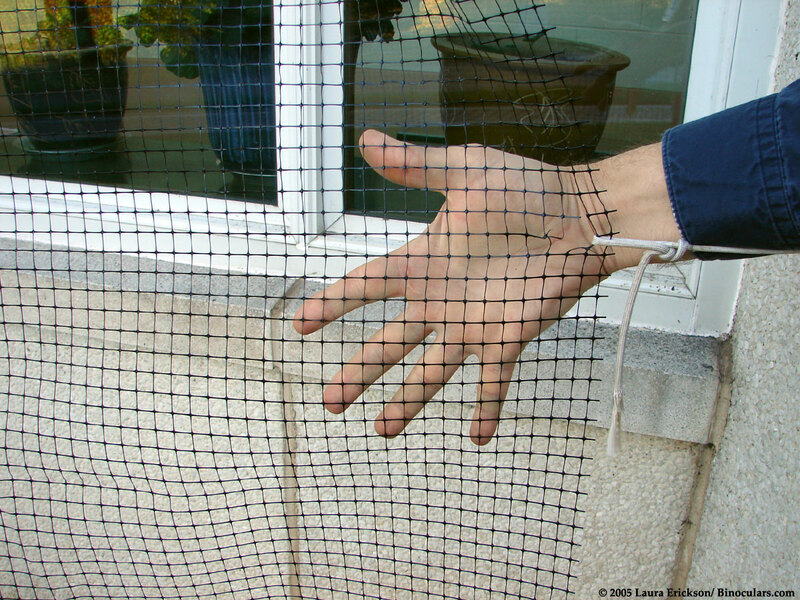 Feeders placed far away from the windows—at least 20 or 30 feet—can also be safe because at that distance, the birds are more likely to key in on the whole house than the windows. 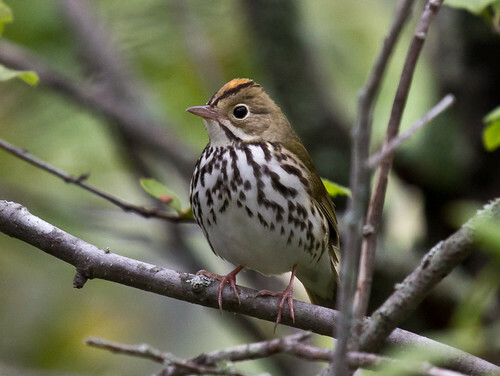 Feeder placement doesn’t make a bit of difference in the case of Ovenbirds and other insectivores that just happen to be in our yards. 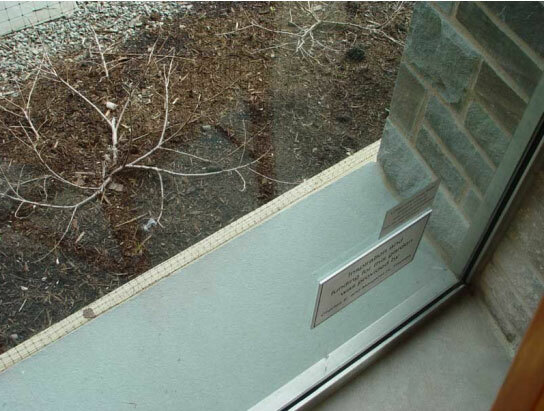 To protect all birds, one approach is to break up reflections in the glass using closely spaced decals or special tape on the outside of the glass. 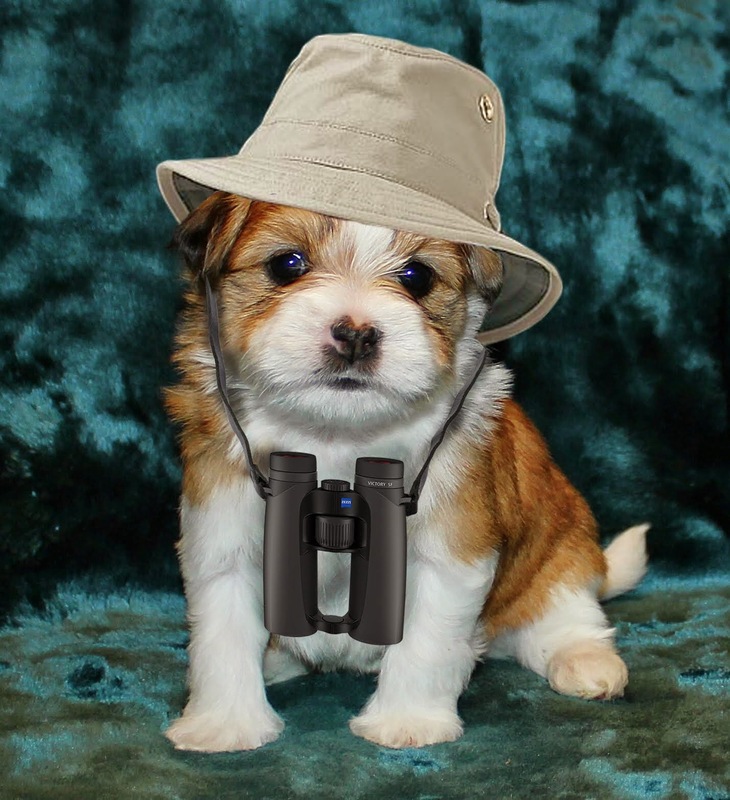 The American Bird Conservancy sells a special tape designed specifically for this purpose. 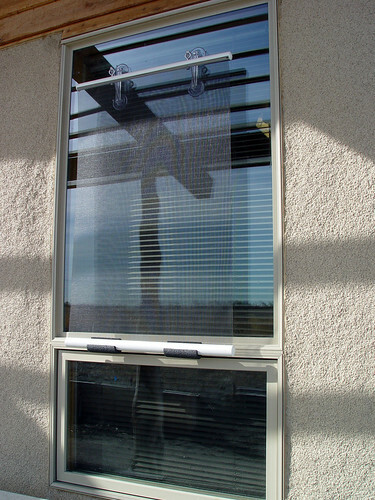 Another approach is to get screening or netting on the outside of the window, as taut as a trampoline and set 3 or more inches from the glass. 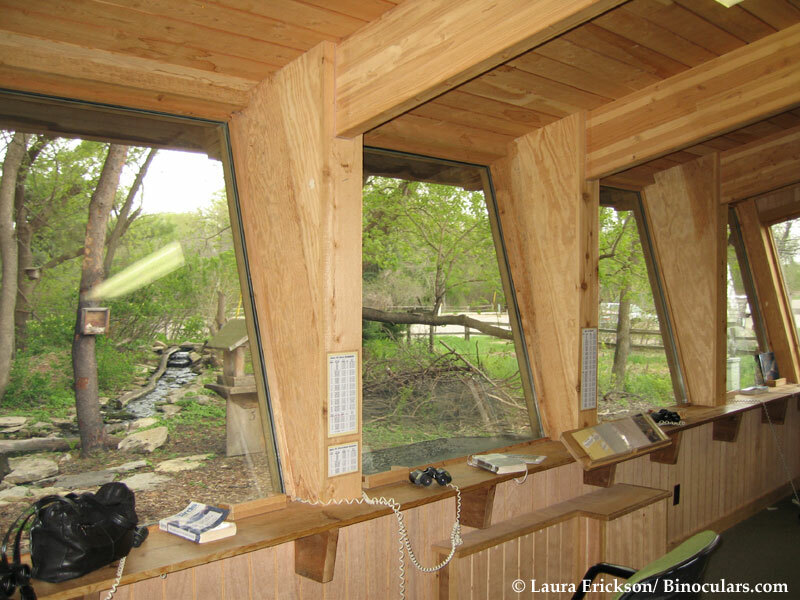 The huge window overlooking the bird-feeding station at the Cornell Lab of Ornithology is bird-safe thanks to the taut netting covering the window. 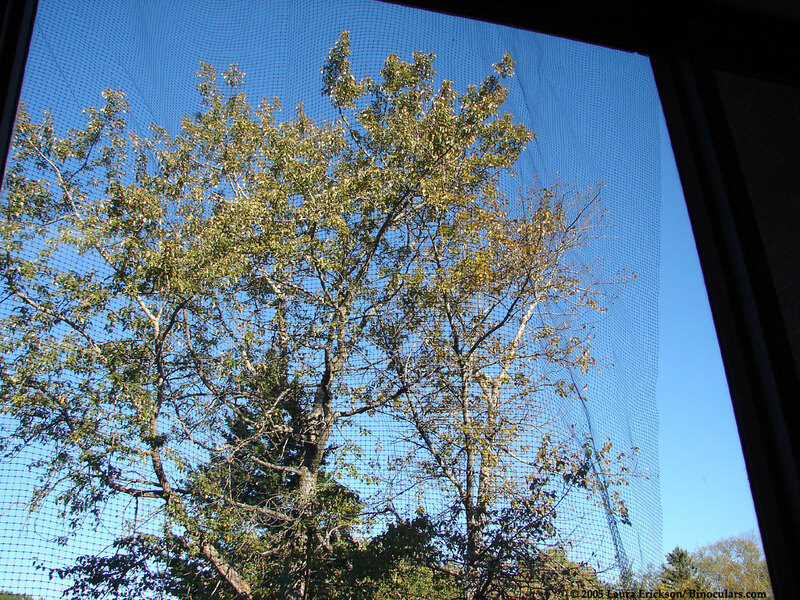 The window glass is on the inside of the framing, and the netting on the outside, far enough from the glass to work like a trampoline if birds do hit. 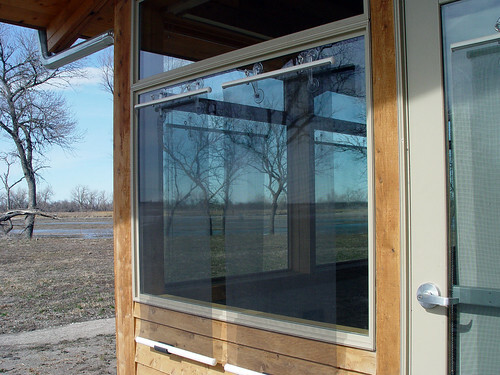 These windows at the Quarry Hill Nature Center in Rochester, Minnesota, are angled downward. 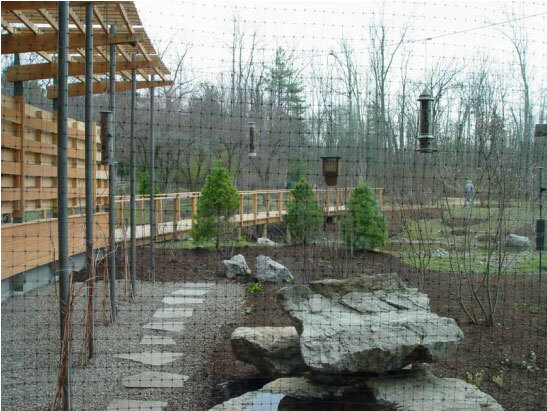 Birds at the nearby feeding station see ground, not sky or trees, reflected, so don't fly toward the glass. 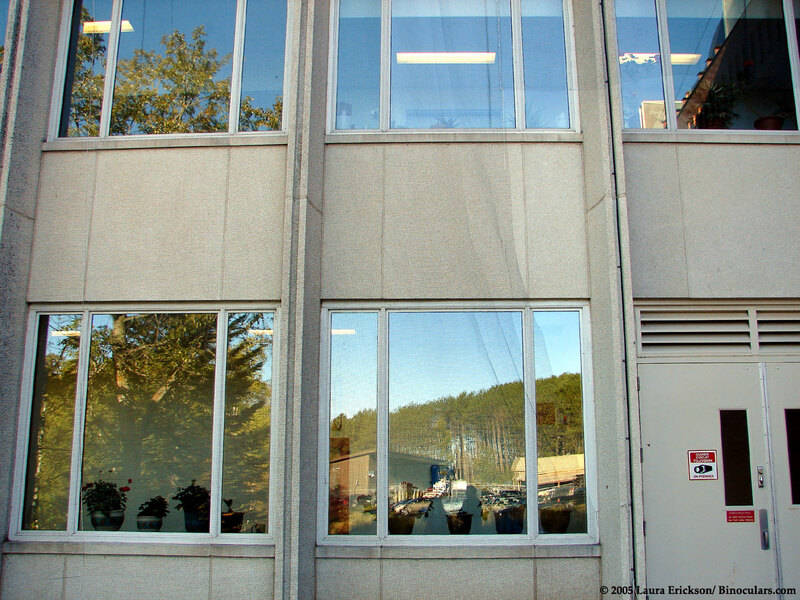 The EPA lab in Duluth, where my husband works, was a constant source of avian mortality during migration until people working there started covering the windows with netting in spring and fall. This has worked effectively for many years. The view from inside is still quite nice. 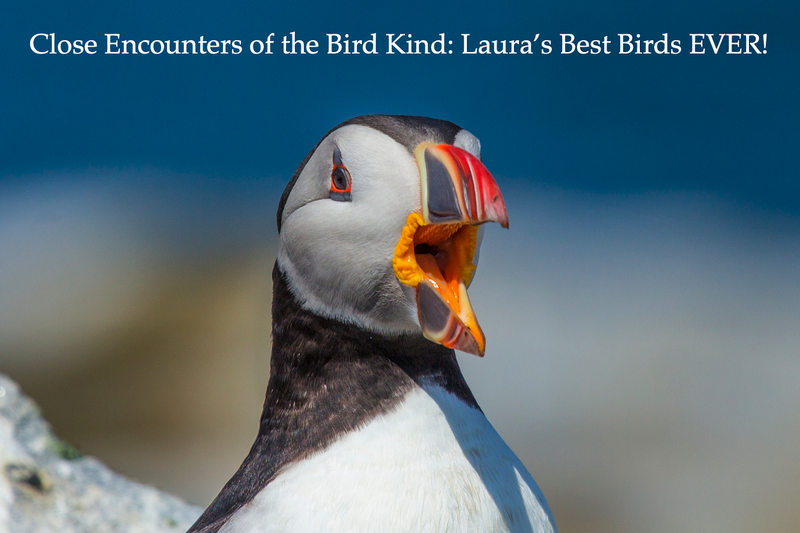 Some birds do start noticing glass when they can spend time near it. Watch this young Evening Grosbeak figure it out. It could still easily collide with glass, just as people do when a glass door isn't properly marked, but not one of the Evening Grosbeaks visiting this window feeder collided with my windows. This Black-capped Chickadee knows to tap on the window to catch my attention if s/he wants a mealworm. 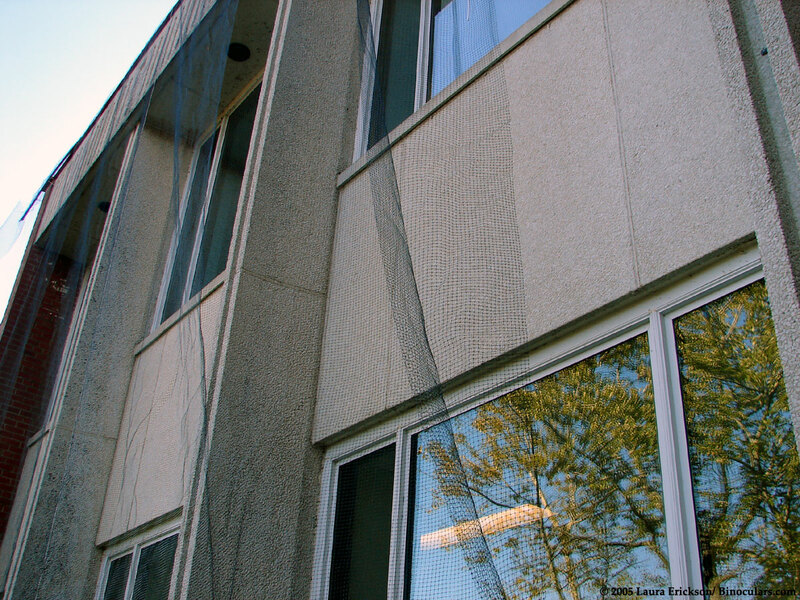 What wonderful people at your husbands building to put the netting up during migration. Thank you to them all! 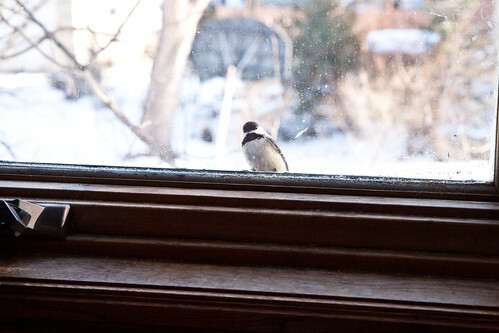 And how did you end up with a chickadee tapping on the window to get mealworms? Amazing!